The OHAUS 16 kg Capacity Analog Heavy Duty Orbital Shaker is designed for a wide range of applications that require basic shaking control. Shaker provides reproducible motion that is evenly distributed throughout the entire surface of the tray. Accu-Drive Shaking System: The exclusive patented Accu-Drive Shaking System delivers exceptional speed control, accuracy, and durability. The shaking system continuously monitors shaking speed and maintains set-point, even under changing loads. When unit is set to a speed above 100 rpm, the speed accuracy is ± 1% of set speed. When set under 100 rpm, speed accuracy is ± 1 rpm. Operating Features: Microprocessor Control: The variable speed microprocessor control provides consistent uniform shaking action. The shaker will automatically restart after a power interruption. Triple Eccentric Drive: Permanently lubricated ball bearings and maintenance free, brushless DC motor provide reliable service and continuous duty operation. LED Display: Touch pad controls with easy-to-read, independent LED displays for speed and time allow operator to view both settings at once. Provides repeatable and accurate results every time and is easily visible across lab benches. Timer will display elapsed time or, when programmed to user defined limit, will shut off unit when time reaches zero. Display will show last used settings, even after power has been turned off. RS232 Interface: Provides two-way communication for data logging and unit control. Speed Calibration Mode: Allows user to automatically recalibrate speed display Load Sensor: A built-in load sensor detects unbalanced conditions and automatically reduces rpm to a safe speed to protect samples. Overload Protection: Audible and visual signals will activate when system detects an obstruction or overload of the tray. Speed Ramping Feature: Slowly increases speed to desired set-point to avoid splashing. Audible Alarm: In timed mode, alarm will sound when the time reaches zero. Alarm has optional mute function which can be set from the touch pad control. Channels fluids away from internal components. Operating Conditions: Unit can be run in cold rooms, incubators, and CO2 environments from –10 to 60°C, maximum 80% relative humidity, non-condensing. 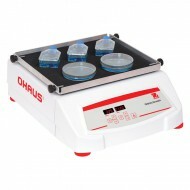 Applications: Cell cultures, solubility studies and extraction procedures. Unit includes a detachable, 3-wire cord and plug. Unit is also supplied with an 27.9 × 33 cm non-skid rubber mat.